White Belt Ranks: These ranks are associated with the study ofbiomechanical positions; guarding positions, striking positions, blocking positions, parrying positions, grappling positions, and throwing positions. Yellow Belt Ranks: These ranks are associated with the study ofbiomechanical actions; guarding actions, striking actions, blocking actions, parrying actions, grappling actions, and throwing actions. Orange Belt Ranks: These ranks are associated with the study ofbiomechanical presentations; guarding presentations, striking presentations, blocking presentations, parrying presentations, grappling presentations, and throwing presentations. Green Belt Ranks: These ranks are associated with the study of techniques; guarding techniques,striking techniques, blocking techniques, parrying techniques, grappling techniques, and throwing techniques. Blue Belt Ranks: These ranks are associated with the study of tactics; guarding tactics, striking tactics,blocking tactics, parrying tactics, grappling tactics, and throwing tactics. 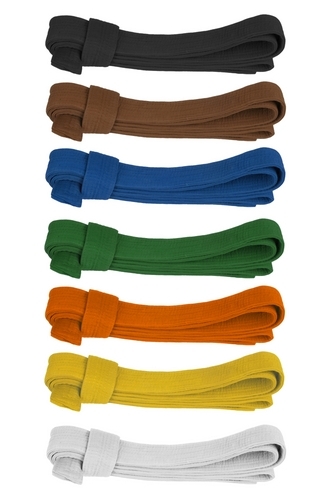 Brown Belt Ranks: These ranks are associated with the study of strategies; guarding strategies,striking strategies, blocking strategies, parrying strategies, grappling strategies, and throwing strategies. Black Belt Ranks: These ranks are associated with the completions of the system’s skill sets; guarding skills, striking skills, blocking skills, parrying skills, grappling skills, and throwing skills. Posted on October 10, 2012, in Ranks. Bookmark the permalink. Leave a comment.